This is a classic red spiny oyster pendant with hand-cut inlaid tiles of Kingman turquoise, jet and white mother of pearl. 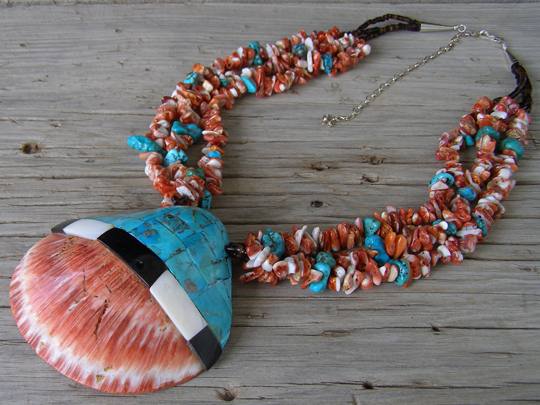 This is strung on three strands of red spiny oyster beads interspersed with small nuggets of Kingman turquoise. The strands are finished off with fine-diameter pen shell heishi and terminate in Sterling cones at the catch. A six-inch extension chain allows for adjustment of the length. This is a very nice bit of handmade work at a compelling price.